McCauley & Co.The Biggest Financial Scandal You’ve Never Heard Of! - McCauley & Co. 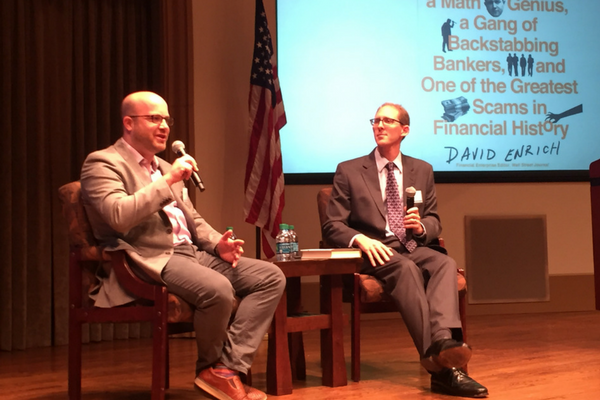 Award-winning financial crime reporter, New York Times editor, and author David Enrich held our Corporate Directors Forum audience spellbound! In a room of over 200 attendees at the CDF event – in partnership with University of San Diego Law School – Enrich regaled us with insider information on his terrific book The Spider Network: The Wild Story of a Math Genius, a Gang of Backstabbing Bankers, and One of the Greatest Scams in Financial History. With unprecedented access to Tom Hayes, the unlikely mastermind behind one of the biggest financial crime scandals ever discovered, Enrich reveals the story about Libor manipulation by some of the world’s largest financial institutions. The Spider Network begins with how math genius and British trader, Hayes, figured out how to change an obscure interest rate in order to benefit his employers – to the tune of hundreds of millions of dollars – in plain sight of his bosses, with an alliance from his team and big bonuses to boot! Besides being a terrific read, The Spider Network raises a larger question of the culture of dishonesty in powerful financial institutions and the pecking order which tends to throw the little guy under the bus. Hayes maintains that his criminal activity was condoned and encouraged by his superiors and yet, no one else was convicted. David Enrich currently serves as the New York Times Finance Editor. He is the former Financial Enterprise Editor at the Wall Street Journal and is the recipient of numerous journalism awards, including the George Polk Award for covering insider trading, and the Overseas Press Club Award in 2012 for coverage of the European Debt Crisis.